NEW YORK (Dow Jones)--Comex gold and silver futures had little reaction to al Qaeda leader Osama bin Laden's death, paring overnight losses on a weaker dollar ahead of a quiet, low volume trading day Monday. Gold for May delivery, the front month contract, was down $5.20, or 0.3%, at $1,550.80 per troy ounce on the Comex division of the New York Mercantile Exchange. The most actively traded gold contract, for June delivery, was down 0.3%, or $3.60, at $1,552.80 per troy ounce. Bin Laden was killed Sunday in a military operation in Pakistan, after the U.S. learned of his location. President Barak Obama announced the news late Sunday night. The death ends a near decade-long manhunt for the architect of the September 11, 2001 terrorist attacks that left 3,000 people dead. Gold prices had slipped ahead of the bin Laden news, and had pared those losses early Monday. "I don't really see much bin Laden response in the market, gold is just a few dollars below its highest ever closing price," said Frank Lesh, broker and futures analyst at FuturePath Trading. Silver prices also climbed off their lows after tumbling 12% ahead of the bin Laden news in Asian trade. 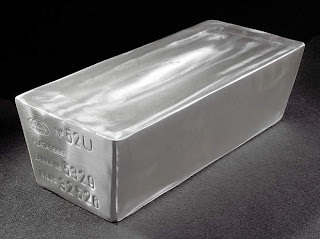 Silver for May delivery, the front month contract, recently was down $3.044, or 6.3%, at $45.540 per troy ounce. The most actively traded silver contract, for July delivery, was down $3.324, or 6.8%, at $45.275 per troy ounce. The sharp decline came amid thin trading volumes, and some market participants pointed to "disappointment" over the contract's failure to breach the psychologically important $50 level last week. Silver prices spent much of last week near record levels, but trading had grown increasingly volatile as market momentum slackened. "We might be looking at least at an intermediate term top for the silver market," said Lesh. Exchange operator CME Group Inc. raised trading margins on silver contracts twice last week, citing volatility. The exchange enforces higher trading margins to protect market participants against adverse price swings. Both precious metals drew support from a weaker dollar, which slipped versus the euro. The single European currency was recently at $1.4834, from $1.4810 late Friday in New York. Dollar-denominated gold and silver futures appear cheaper to buyers using foreign currencies when the dollar weakens. Precious metals trading was likely to remain low volume and volatile Monday, as London markets are closed for a bank holiday. Individual trades have a greater influence on prices when trading volumes are thin.